After the devastation of hurricanes Irma and Maria this year in the Caribbean, the boating and tourism industries in general, are gradually recovering. The shipyards display well-filled order books and are recruiting determinedly. If the winter season in the West Indies was bleak, what were the general trends for boat rentals in 2017? GlobeSailor takes stock of the nautical sector, which is still very dynamic despite a year of upheaval. 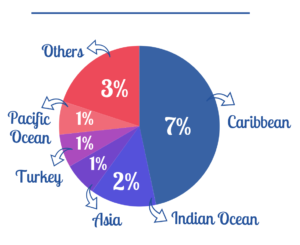 Discover all the key figures & trends of the boat rental market in Europe and worldwide. This year again, the Mediterranean basin attracted the largest number of sailors. Even Top Destinations in 2016 but the ranking is changed: Croatia is on the top step of the podium! 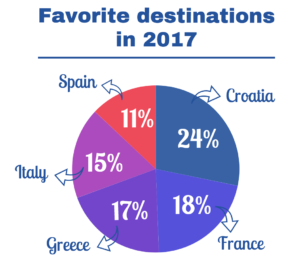 Accounting for 24% of (habitable) boat rentals – all nationalities combined – Croatia takes the lead. Croatia accounted for 25 % of all UK client’s departures, with Greece following up closely behind with 24%. 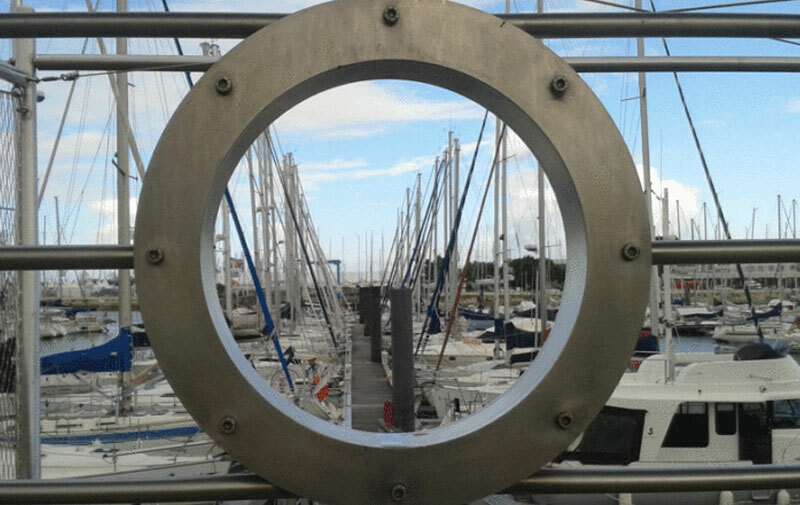 The growing popularity of Croatia is driven by the beauty of its navigation basin, but also by the quality of its maritime infrastructures, the professionalism of the local hirers as well as by the recurrent efforts of Croatia’s Tourist Office to promote their destination across the internet and social networks. Greece – which accounts for 17% of all bookings made in 2017 – has been making a good comeback after declining in popularity in 2016 – with only 10% of all bookings – thanks to a more reassuring social and economic context last year. 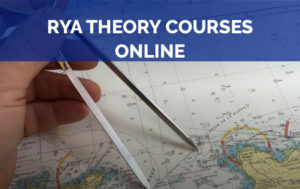 Note that the Russian clientele has returned to a preference for the Greek islands after several years of absence, thanks to the revaluation of the ruble. Italy (15% of departures) and Spain (11%) complete the ranking with stable ties this year. The Aeolian Islands and Palma (Balearic Islands) are the bases of most requested departures. Across the Atlantic, hurricanes Irma and Maria destroyed 400-500 boats, according to estimates by local renters. Saint Martin and Tortola were the most affected destinations with a dry loss of 20 to 30% of their bookings in 2017. Guadeloupe and Martinique also seem to have been impacted because there were 8% less cruise requests in September to December, than at that time the previous year. For British clients, the Caribbean accounted for only 8% of departures, though this is partly due to it’s greater popularity with Americans. 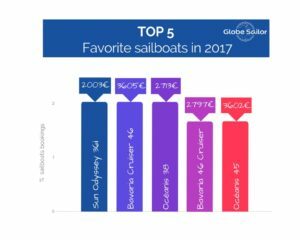 On the other hand, it seems that sailors are increasingly choosing exceptional destinations such as Thailand and Seychelles, both of which showed a 9% increase in bookings by the end of 2017! Depending on the destination, the choice of boat type varies considerably. 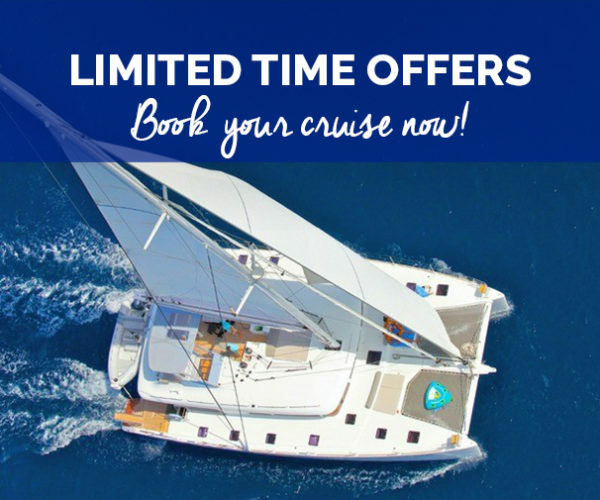 For example, catamaran cruises account for only 10% of bookings in the Mediterranean compared to 35% in winter destinations (Caribbean, Indian Ocean, Asia, Pacific). 2 out of 10 catamaran customers chose to book with the services of a skipper on their boat. 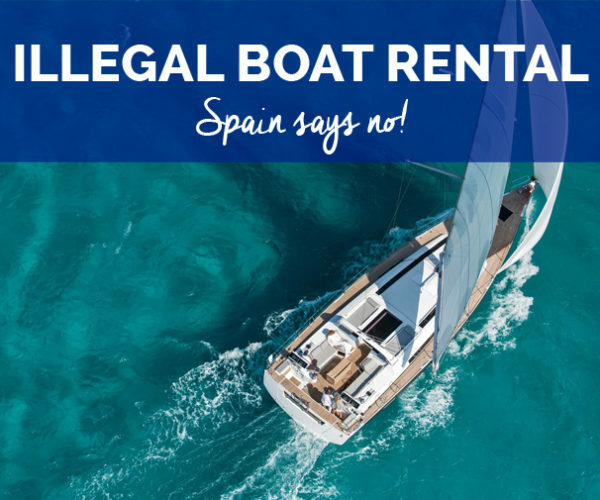 Spain is the only Mediterranean destination where the number of catamaran rentals has dropped compared to 2016. Motor boat rental accounts for only 6% of bookings made on our site. Here are two histograms to illustrate the 5 most popular models of sailboats and catamarans in all destinations, as well as the average budget per week spent by our customers booking these boats. The Lagoon shipyard dominates the rental market with over 44% of total catamaran bookings! Great success for Bénéteau and the Oceanis 38 and 45 who are on the podium of sailboat models! There is a growing enthusiasm for cruising aboard small units, with a number of skippered boat reservations that continue to increase from year to year (from 16% in 2015 to 22% in 2017). The number of cruise ship reservations increased by 50% in 2017, and almost all Mediterranean cabin cruises for next summer are already full. 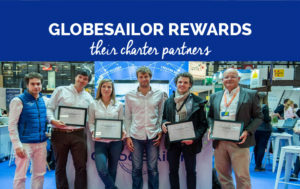 Crewed boat rentals, cabin cruising, co-navigation and private hire all benefit the nautical sector, which is tending to become more democratic and open to a new tourism: blue, ecological and off the beaten path… ‘Le Salon Mondial du Tourisme’ (a major annual world tourism fair held in Paris) next March has even bet on the ‘Blue’ for its 2018 theme. 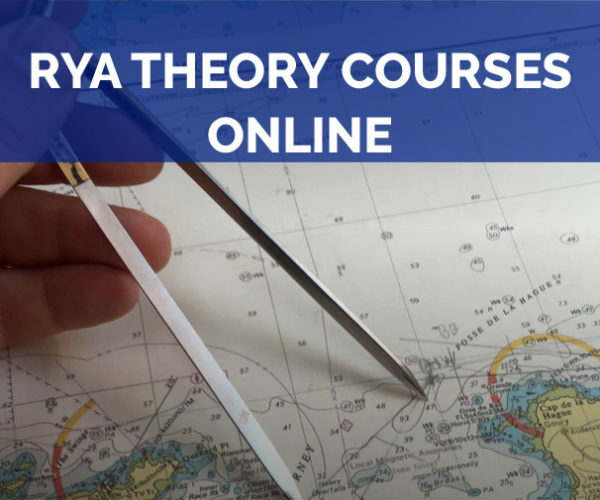 Sailing intrigues the hesitant, fascinates the aficionados and surprises the most undecided… It is easy today for a beginner to embark and obtain their first navigation license with the help of professionals or specialized associations. The response to this surge of interest in cruises is undoubtedly also due to the large number of records and media events that sailing has focused on this year: the breathtaking victory of Armel Le Cléac’h in the Vendée Globe, Francis’ magnificent record Joyon and his crew on the Jules Verne Trophy, Thomas Coville’s new solo World Tour record and then François Gabart; the mythical ‘The Bridge’ race between the Queen Mary II and 4 maxi-trimarans… Sailing champions have entertained us all year and their exploits captivated a crowd of spectators, propelling the nautical sector to the front of the stage! There is every reason to believe that boating and boat rentals will continue to grow at a steady pace. The autumn cruising season is getting booked up, especially with upcoming shows, such as Southampton, where we will be exhibiting. New bases and destinations open every month: after Indonesia or Sri Lanka, it’s Japan‘s turn, for example, to welcome new yachtsmen looking for exoticism aboard a Bali 4.0! The beginning of a new Asian market? 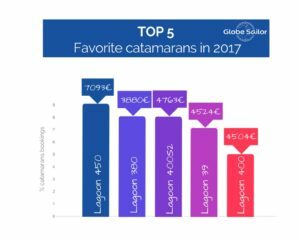 The shipyards unveiled new models that were more spacious and comfortable than ever, and displayed good growth performance (+ 23% for Lagoon, + 26% for Catana and + 12% for the Bénéteau group). Lagoon even announced an expansion of its production capacity and exceeded the symbolic threshold of 1,000 employees! Professionals have found their smiles again after several gloomy years. It is hoped that this upturn in the market will also benefit the tourism industry in general, with more innovations, new products and an ever-increasing attractiveness to an uninitiated clientele. NB: all these figures are from the reservations of our customers and do not engage our responsibility for any other use. 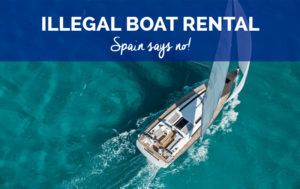 With our presence in more than 150 destinations and 7 international markets, our statistics are based on a panel of 40,000 international customers who rented a boat in 2017 from our network of 800 professional boat operators partners. 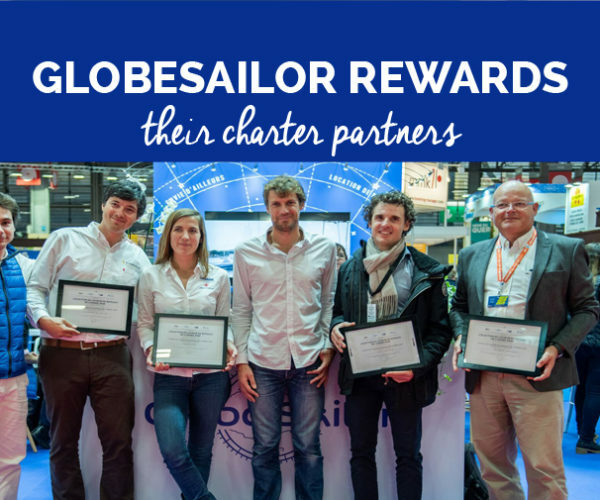 GlobeSailor Reviews: A Legitimate Charter Company?